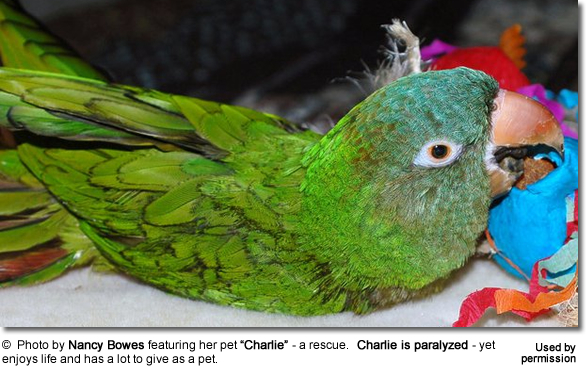 "There are no 'handicaps' - only challenges to overcome ..."
Breeders routinely put to sleep "Special Needs" birds, sometimes because they can't be bothered with it, but at other times because they simply can not find good homes for them. 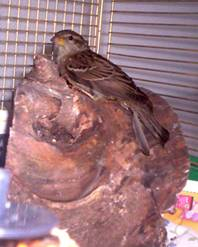 PLEASE let your local vets and breeders know you would like to adopt special needs birds. Offer to purchase the bird, rather than expect to get it for free. By asking for a free bird, you diminish the value of the bird, and lose credibility as a good home. Featured below: Erin - a beautiful pearl hen. Her legs are twisted and she walks on the sides of her legs. She also has a deformed beak and a deformed wing. 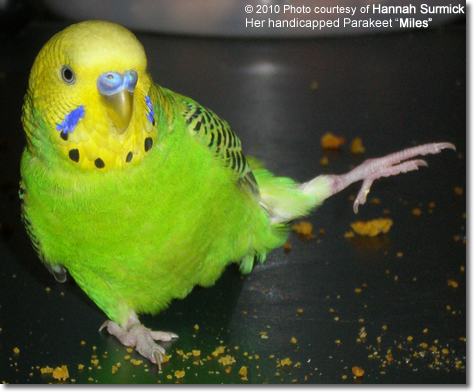 Although Erin is handicapped, she is a very happy bird who lives a very active life. She does have a cage specialized for her needs, but has adapted well to her condition. Featured above: Taylor - a gorgeous white-faced male with splayed legs. 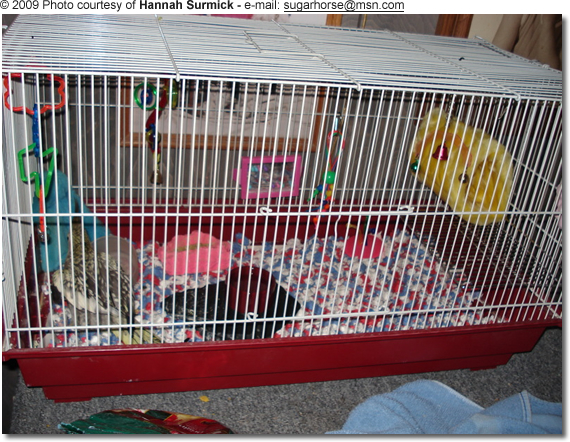 Both of Taylor's feet are turned in, yet he does not require any special changes in his cage, besides having shelves to rest on instead of perches. 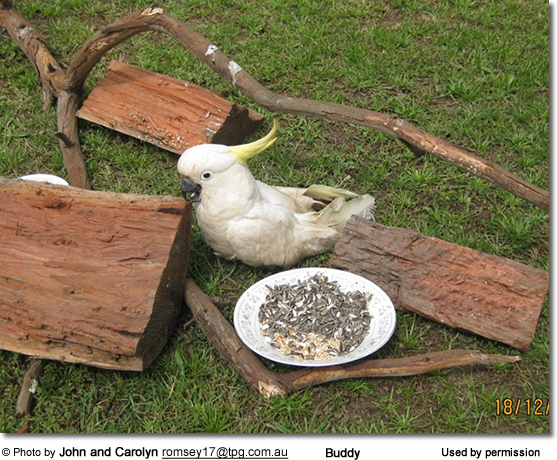 Both birds are very personable and love people, and spend much of their time out of the cage. Erin's cage is actually a small animal cage often used for rats or hamsters. Because her feet are completely twisted around, she can't hold on enough to trust any height to her cage. The floor of her cage is covered in small animal 'fluff' normally used for hamsters. Its dust free, softer, and safer than wood chips. Erin has a shelf perch in her cage so she can feel she is up high (thus increasing her level of security). All her toys are floor level, or hanging where she can reach them, and her water dish is glued to a rock so she cant spill it and get a chill. Miles had been abandoned at a pet store by someone who claimed they 'just had parakeets they needed to get rid of'. When put up for adoption, Miles was ridiculed for his deformity. People were disgusted by angle that Miles leg twisted out at. He was taken off display and hidden. Miles was on deaths row, as no one saw any other option but to put him to sleep. I went and asked for him and took him home to start a new life.Miles left leg twists out at an almost 90 degree angle while his other leg is normal. He was never hand fed and never handled, but now he will allow me to take him out of the cage to hop around with the other birds. 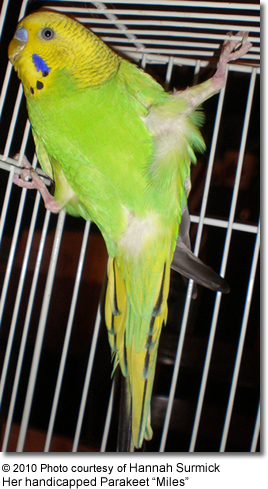 Miles gets around his cage by holding a perch with his normal leg and holding the side of the cage with his crooked leg. Out of the cage, Miles hops on the one good leg and lays on his belly to rest. 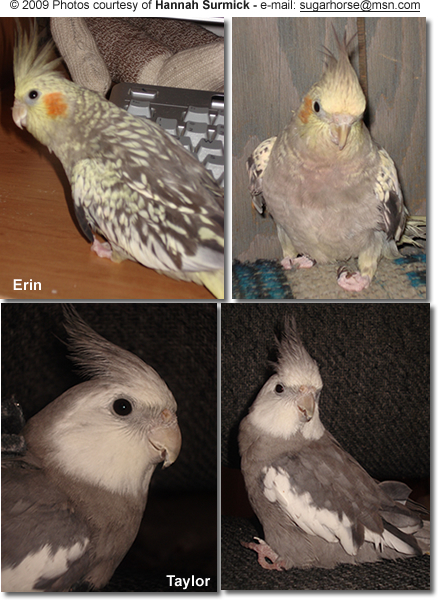 He adores his bird sister, Erin, and when out of the cage will follow her around and preen her tail feathers or crest. Meet a very special duck "Dirty Bird"
Oscar -- the special tiel, who makes us realize that life is precious ... as precious as he was to those who made it possible for him to live and be happy. Cuddles - the 'hipless' cockatiel and Gazer - the stargazing lovebird. I would love to publish it on this website! Just e-mail us details. The Avianweb strives to maintain accurate and up-to-date information; however, mistakes do happen. If you would like to correct or update any of the information, please send us a message. THANK YOU!